My friend, fellow Fellow of the College of Law Practice Management and occasional collaborator, Caren Ulrich Stacy, has launched a new initiative - the OnRamp Fellowship - with the goal of increasing gender diversity in law firms. The Fellowship is a re-entry platform that matches women lawyers returning to the profession with law firms for a one-year, paid training contract. The program allows women an opportunity to demonstrate their value in the marketplace while broadening their experience, skills, and legal contacts. Law firms benefit by gaining access to a group of highly-talented, diverse lawyers who want to return to and advance in the profession, particularly into leadership roles. "These women were highly sought after when they graduated from law school, and they should be again," says Caren Ulrich Stacy. "The first goal is just to bring more women back into the fold. The second goal is to find women who have the potential to advance." (AmLaw Daily "New Fellowship Aims to Restart Dormant Legal Careers." In addition to the training provided by the law firms, additional contributors have donated their time and expertise to the Fellowship to provide individual coaching and training classes in areas such as business development, public speaking, management skills, negotiations and numerous other topics. I am pleased to be participating in the initiative by offering training on pricing and project management, critical skills necessary for delivering client value. The several dozen other contributors (here) represent a who's who of thought leadership in today's changing legal marketplace. There are four law firms participating in the pilot program: Cooley, Baker Botts, Sidley, and Hogan Lovells. Applications and interviews for the initial Fellowship are underway and selections will be made by March of this year, with a start date in May. For more information, visit the OnRamp Fellowship site or view the American Lawyer article here. I'm sure there are many people, particularly the younger generation, seeing their Tumblr, news feeds and Facebook walls blow up with Nelson Mandela tributes and who, while recognizing the name, still wonder what's the big deal. We've all read in our history books about some of the heinous treatment of one people by another and because these are history books we get the sense that by and large humanity has evolved past such acts. Sure we hear short snippets in the news of atrocities such as genocide, slavery and ethnic and religious purges taking place today, but they always seems to take place in far off countries and often among people that don't look or act like us so it feels pretty distant. Sadly, this is human nature. I grew up in era where Apartheid was legal in South Africa, and proudly so, at least as characterized by some of its country's leaders. While South Africa was far away and many of its people didn't look like us, many of the leaders spouting support for institutionalized hatred looked a lot like us and spoke our language on the newscasts. With the emergence of cable news and 24-hour news cycles, it was hard to escape the reality that people like us were still pursuing heinous policies against others. During my formative years apartheid moved from being a distasteful policy perpetrated in some far-off land to the forefront of our consciousness. For many US generations, college has been a place where political activism takes hold and it's no coincidence that some of the most compelling moments in political protests, such as those against the war in Vietnam or those in support of Civil Rights, took place on college campuses. But my '80s college generation wasn't exercised about much. We complained about the labeling of "dangerous" music and our musical heroes produced music videos expressing fear of nuclear war, but for the most part our economy was humming along and we were apathetic. Until apartheid. I can't say that I joined marches or protests against apartheid because I don't recall any being organized at my school, but I can say we cared, and cared deeply. There are no conversations as fascinating and wide ranging as those that take place in college dorm corridors at 3 AM, punctuated by kids who are invincible, who know just enough of politics and world events to be dangerous and who are still supremely confident that they have all the answers to solve the problems foisted upon us by earlier generations. We would debate apartheid and declare that had we been in charge we would never have allowed it to take root, and if we could have our way now we'd eradicate it, though we didn't know how. These conversations crossed racial, political and socio-economic lines, in part because many of us hadn't yet established our own personal ideologies and selected our lifelong news sources that would comfortably reinforce our own biases. From our business and economics classes we understood that the issues were probably more nuanced than "simple" hatred by one race of another -- and make no mistake, there were business and world leaders and emerging leaders of our own generation supporting apartheid at that time, or at least not condemning it because South Africa served their commercial interests. But for most of us, it was a black and white issue - pun intended, but no disrespect intended. Our musical idols provided some measure of assistance, by refusing en masse to play Sun City, at that time popular stop on many global concert tours. And we radio station geeks would both play the relevant anthems ("Little Steven" Van Zandt and Artists United Against Apartheid "I Ain't Gonna Play Sun City" comes to mind) and refuse to play music from artists who continued to tour South Africa (I'm looking at you Elton John and Queen, among others) though admittedly our gnat-like memories faded when hot new songs by these artists were released. But to the extent we cared about global politics and human rights in that era, apartheid was the subject of our activism. And Nelson Mandela figured prominently in the conversation. Mandela was released from prison after I graduated, and while the task of earning a living replaced my late night world-problem-solving discussions, none of us could help but be aware, and impressed by, the towering intellect, passion, strength and, yes, compassion, of this man who had spent nearly three decades incarcerated for his stand against his government's injustices. Let's ponder that for a second. There are notable movies illustrating how those incarcerated for long periods often struggle with returning to society. And of late there is a seemingly constant stream of wrongly-convicted prisoners released after DNA evidence clears them, typically years if not decades later, and unfailingly the vibrant young people who went to jail emerge as broken shells after a lifetime of imprisonment. And yet Mandela emerged with an unbroken spirit, ready to catalyze the movement to finally ban apartheid. He then led his country after an election in which he earned over 62% of the votes, one of the most stunning reversals of fortune I've observed in my lifetime. He did not act alone. There were, of course, many others, whose names won't be recorded in the history books, fighting apartheid. But Nelson Mandela is not, for me and for many (and hopefully most) of my generation, some distant history book reference; he's the embodiment of what one person can do to fight injustice on a scale that seems impossibly insurmountable. For that, I am pleased to have been a witness. And I hope my daughters, nieces and nephew, some of whom are of mixed race, and others in the younger generations take a moment to study and reflect on Nelson Mandela's accomplishments (some already have). There's been some muttering about the disproportionate air time devoted to a popular film star who died tragically this week and what an injustice it is that Nelson Mandela's passing isn't generating nearly as much viral attention. I bear no grudge against the media, or the young film fans, who can't get enough news of their deceased movie star. But trust me, when all is said and done, Nelson Mandela, both his life and his passing, will have a far greater impact on our social consciousness than any other news we'll read this week. He was, and is, that important. He had his failings, as we all do, and we'll begin to hear of his imperfections, and rightfully so. It's important to note that our icons put their pants on one leg at a time just like the rest of us, and have weaknesses just as we have. But that doesn't detract from what he accomplished. Thank you, Nelson Mandela, for what you've done and for showing us how it's done. Rest in peace. For the eigth straight year, the InnovAction Awards have recognized outstanding innovation in the delivery of legal services, demonstrating what can happen when passionate professionals, with big ideas and strong convictions, resolve to create effective change. The College of Law Practice Management is please to announce that Littler Mendelson, PC and Seyfarth Shaw LLP are the two recipients of the coveted 2012 InnovAction Awards. Littler was selected for Littler CaseSmart™. In response to a client challenge, Littler Mendelson developed Littler CaseSmart™, a solution that combines a re‐engineered legal process (deployed in a client‐dedicated, team‐based model) that is built on a technology platform that allows for the strategic management of a high ‐volume of administrative agency charges (such as federal, state, and local charges of discrimination), at a fixed, per‐charge fee. Littler CaseSmart™ provides transparent, privileged, and real‐time online access to the status of the client’s legal matters, as well as a dashboard of key performance indicators, visual graphics, and reports. The Littler CaseSmart™ approach completely re‐engineers the way in which matters are handled, maximizing the use of technology to anticipate attorney needs as they conduct research, prepare responsive documentation and perform legal and risk analysis in order to enhance efficiency while maintaining firm profitability. Seyfarth Shaw was selected for its SeyfarthLean program. Well before the fall of the financial markets, Seyfarth leadership anticipated the need for better ways for a law firm to meet its clients’ rapidly evolving needs for value, efficiency and continued high quality of legal services. 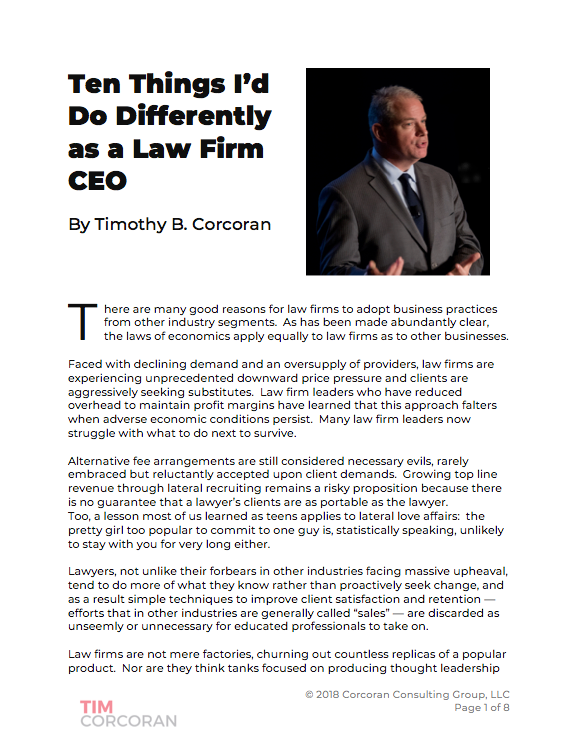 Based on that simple goal, we have become the only large law firm to build a distinctive client service model – called SeyfarthLean – that combines the core principles of Lean Six Sigma with robust technology, knowledge management, process management techniques, alternative fee structures and practical tools. The broad, systemic use of such a model across multiple practice areas is unique to the legal profession and reflects a fundamentally different way of thinking about how to deliver legal services. The awards will be presented on Friday, October 26, at a special session during the 2012 Futures Conference, held in conjunction with the Annual Meeting of the College of Law Practice Management in Washington, DC. There were a number of other impressive submissions from law firms and legal organizations this year, including Ulmer & Berne LLP, Sutherland Asbill & Brennan LLP, New Family, McAngus Goudelock and Courie, Lawyer Metrics LLC, Hinshaw & Culbertson, LLP, Fish & Richardson, P.C. and Baker Donelson. See here for more details on these initiatives. For the InnovAction Hall of Fame which includes information on past winners, see here.